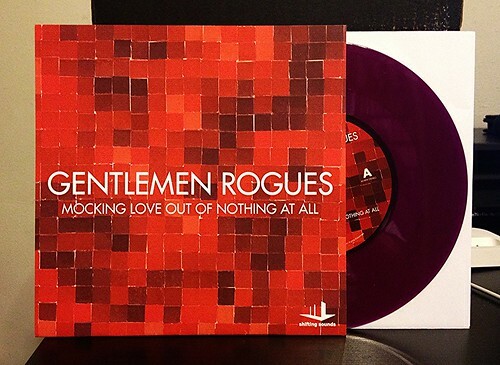 After their fantastic 10" EP that came out last year, I was eager to hear more from Gentlemen Rogues. They answered the call with this 2 song 7" that really showcases their songwriting chops and ear for great melodies. The A-side is "Mocking Love Out Of Nothing At All." It's a mid tempo song that takes me back to bands like Tugboat Annie. The crunchy verse builds nicely into an intricate guitar jangle chorus with fantastic backing vocals and dynamic guitar work. The B-side "Mountains Of Your Head" is a Buffalo Tom cover and you can tell that Gentlemen Rogues do take inspiration from the sort of big time 90's pop band scene that Buffalo Tom was a part of. It's a nice version of the song, but Gentlemen Rogue's originals are so good, I'd probably just prefer another instead of a cover song if I had my choice. Still, it's a great little 7" and once again I'm eager to hear more. I read that the band is currently recording for another EP. Come on guys, enough with the EPs, let's get a full length going!